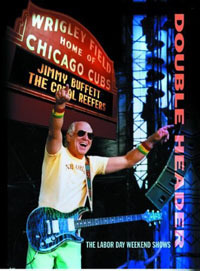 Jimmy Buffett played two shows at Wrigley Field in 2005, and he’ll reportedly head back there in 2017 after the Cubs won the World Series this year. A twitter friend that was listening to Radio Margaritaville heard Jimmy make the pronouncement. The 2005 Wrigley Field shows were the first ever concerts at the landmark stadium. It took Buffett a decade to persuade the front office to hold a show there. The back-to-back gigs were wildly successful and a live DVD was released a year later: Live at Wrigley Field.